ISLAMABAD • Malaysia has shown interest in buying JF-17 Thunder fighter jets, halal meat and rice from Pakistan, and will soon procure anti-tank missiles from Islamabad, Pakistan’s Finance Minister Asad Umar said yesterday. Officials from the two countries have signed memorandum of understanding for five “big projects”, he told journalists during an informal discussion. 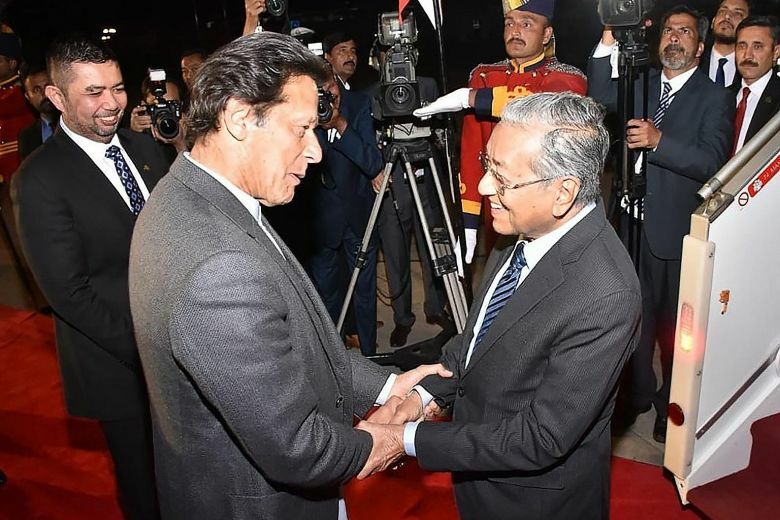 Visiting Malaysian Prime Minister Mahathir Mohamad and his Pakistani counterpart Imran Khan held a one-on-one meeting yesterday. Mr Umar said officials also agreed to open branches of their respective banks in each other’s countries, and that Pakistan would try to make use of Malaysia’s knowledge of tourism as it looks to revive its local industry. A senior official had said on Thursday that Pakistan was set to sign deals worth US$900 million (S$1.2 billion) in areas such as telecoms, information technology and power generation during the three-day visit by Tun Dr Mahathir, who arrived in Islamabad on Thursday evening. At a joint press conference, Prime Minister Khan said he admired Dr Mahathir for his stand against corruption. “We actually believe that countries are not poor, corruption makes them poor. Corruption destroys state institutions,” he said. Bernama news agency quoted Dr Mahathir as saying the two countries can “exchange information on how to combat corruption”. Analysts believe the enhanced ties between Malaysia and Pakistan will help improve the latter’s export activities. Since August, Khan has been reaching out to other nations in a bid to shore up foreign investments and financial deposits. Both Saudi Arabia and the United Arab Emirates have also each offered Islamabad loan packages of $3 billion. During a visit in February, Saudi Crown Prince Mohammed bin Salman had signed investment agreements worth $20 billion with Islamabad, including a $10 billion refinery and petrochemicals complex in the southwestern port city of Gwadar. Neighbouring China has pledged nearly $60 billion for energy and road and rail infrastructure projects as part of the Belt and Road Initiative (BRI), known as China Pakistan Economic Corridor (CPEC). They also hope Malaysia will be an opening for them to the ASEAN (Association of South East Asian Nations) countries. Malaysia has shown interest to import Halal food from Pakistan which in fact has a great scope in the world market. There are 1.3 billion Muslims in the world and this Halal food is now moving to a trillion-dollar market. Having huge potential in livestock, dairy and poultry sectors, Pakistan has so far failed to capture its due share in the rapidly growing Halal market. The country is among top livestock producing countries with 160 million livestock and it can export Halal meat products to meet the rising global demand but for this we need to adopt latest technology and trained staff in order to meet the international standards. The establishment of Fauji Meat Limited is a step forward and with the cooperation of Malaysian friends, we can achieve many milestones in this particular field. « How do you know where your olive oil really comes from?